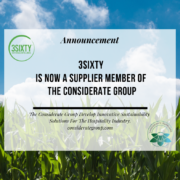 3SIXTY are proud to have been accepted as a supplier member of The Considerate Group. Being part of the Considerate Group supplier roll call is an important step for us here at 3SIXTY. Because they are leaders in their field when it comes to delivering viable sustainability solutions for hospitality businesses 3SIXTY was very keen to be associated with them and it is with huge pride that they see the possibilities in 3SIXTY and the value we can deliver to the hospitality industry as a whole and their hotel member partners. The Considerate Group count among their hotel members such hotel groups like Red Carnation Hotels (owners of Ashford Castle), The Mandarin Oriental Hotel Group, The Four Seasons Hotel Group and The Savoy London to name just a few. The Considerate Group help hotels operate responsibly by using the vast industry experience to deliver innovative ways in which hotels can demonstrate their commitment to making the world that little bit greener. 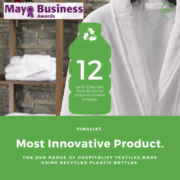 So any hotels reading this you can contact The Considerate Group HERE and they can show you new ways, that will include changing your linens to 3SIXTY towels made using recycled plastic bottles and upcycled ocean waste, to make your hotel as sustainable as possible. 3SIXTY have been honoured to be nominated in the MOST INNOVATIVE PRODUCT award by the Mayo Business Awards. Our range of ecomax bathroom and bed linen textiles for the hospitality industry have the power to transform an area of the hospitality sector that has not seen innovation like this in a very long time. 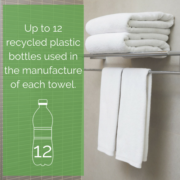 A 100 bedroom hotel, for example, using a range of our ecomax product could help prevent 86,400 plastic bottles from entering landfill or the ocean. Think about that for a second…86,400 plastic bottles will not go in to landfill or our precious oceans just because a forward looking hotel re-examined the way they look at their line operations. We passionately believe that the hospitality industry is uniquely positioned to make a significant impact in the fight against plastic. Take that opportunity now and get in touch HERE so we can show you how your hotel can BE PART OF THE SOLUTION. Every year, 8 million tons of garbage end up in the oceans, 75% of which lay deep on the sea bed. With plastic waste predicted to outweigh the fish in the sea by 2050, this has now become a global crisis. Businesses across a huge range of sectors are turning their focus towards the importance of protecting our planet, and one of the key players is the hospitality trade. As part of a fast-paced industry which uses a high level of textiles, hoteliers are uniquely positioned to make a positive impact on the environment. Ireland based company 3SIXTY was created to help them achieve exactly that. 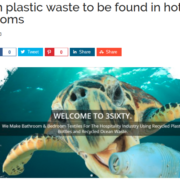 3SIXTY’s mission is to help the hospitality industry become more sustainable. The company creates environmentally friendly bedroom and bathroom textiles that are not only sustainable and socially responsible, but also made to the exceptional standards that guests expect. 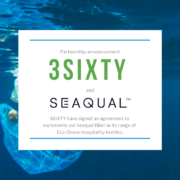 The company has now begun a collaboration with SEAQUAL™; the organization which helps to clean the world’s oceans by upcycling plastic marine waste into beautiful, new everyday products, one of those products is the innovative SEAQUAL™ FIBER. 3SIXTY have decided to exclusively use SEAQUAL™ FIBER in their Eco-Ocean range of towels, bathrobes, bed linen, duvets and pillows. 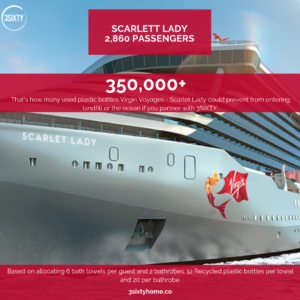 3SIXTY provides hospitality products to hotels, cruise liners and brands. For further details visit https://3sixtyhome.co. More information about Seaqual can be found at http://www.seaqual.com/. 3SIXTY Sustainable Linens Ltd is registered in Ireland under company number 641637. Co. Mayo, Ireland, F28 DW66. Copyright 3SIXTY Sustainable Linens Ltd.